Remember that during storm season, many things can cause outages. Wind, ice and damaged trees falling on the power lines. 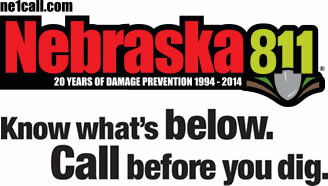 If you see power lines on the ground, don’t touch it and call the Nebraska City Utilities immediately. Lightning searches for the tallest object to serve as a conductor. When lightning strikes electrical equipment, it causes loss of power. The build up of ice and snow can break lines and also tree limbs that can fall and damage lines. Severe wind can cause lines to blow into tree limbs and causes interruptions. The wind can also break tree limbs and cause them to fall on lines. Small animals that climb on poles, transformers and fuses can cause an interruption of power. Digging by contractors can damage underground electrical equipment. To maintain our equipment, we may schedule a planned outage in some area. We will make every effort to notify customers before planned outages, however, at times it may not always be possible. Brief outage may occur momentarily due to our equipment detecting occurrences on our lines (i.e. lightning, tree limbs or critters). Many times our equipment will restore power to the lines if the fault is cleared and lines are not damaged. Extended outages usually occur due to damaged poles, conductors or equipment that require utility personnel to be dispatched to locate and repair the problem. • Supply of nonperishable food and water for everyone in household.